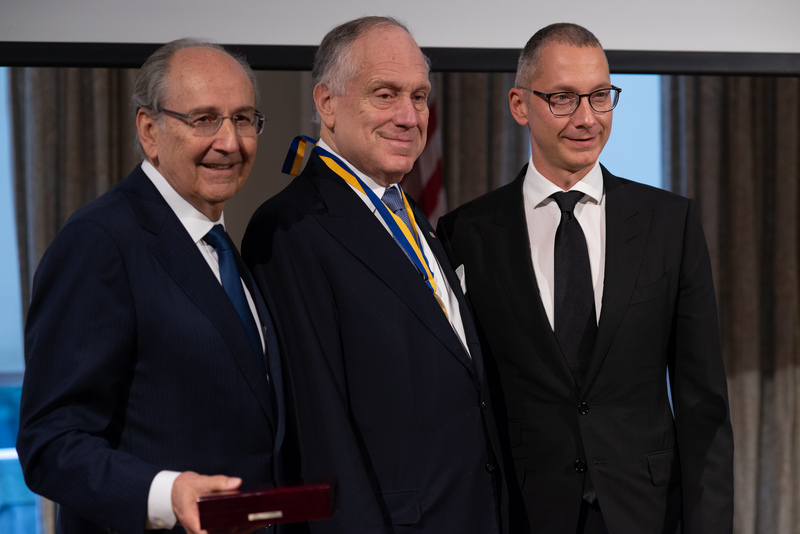 On September 27, 2018, at the Ukrainian Institute of America, The Honorable Ronald S. Lauder philanthropist, activist and president of the World Jewish Congress, received the Metropolitan Andrei Sheptytsky Award for 2018. 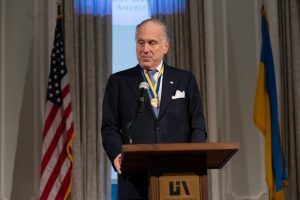 Ambassador Lauder is being recognized for his support of Ukraine’s Jewish community and his promotion of Ukrainian-Jewish cooperation. In Ukraine, he has supported schools in both Kyiv and Lviv for many years and supports a camp for Jewish children and families north of Kyiv. The award was given by Boris Lozhkin, the President of the Jewish Confederation of Ukraine and Vice-President of the World Jewish Congress, along with founder and chairman of the Ukrainian Jewish Encounter James Temerty. Adrian Karatnycky, Co-Director of the Ukrainian Jewish Encounter moderated the event. Berel Rodal, Chair of the UJE Advisory Board, also made remarks, in addition to a testimony by Leon Chameides, who was one of those saved by Sheptytsky. The award was established for contributions to the cause of Ukrainian-Jewish understanding and cooperation and is awarded to people who have dedicated themselves to fostering friendly relations between the Ukrainian and Jewish peoples. Metropolitan Sheptytsky is a model worthy of celebration and emulation, providing a basis for building trust and bridges between communities. Born in 1865 to a prominent aristocratic family, he was the spiritual leader of the Ukrainian Greek Catholic Church from 1901 until his death in 1944. During World War II, he helped save more than the 150 Jewish lives. The Metropolitan sheltered Jews in his own residence at great personal risk, and arranged for Church monasteries to protect well over one hundred Jewish children. Not one of them was betrayed or lost. Metropolitan Sheptytsky also publicly protested against Nazi Germany’s murderous policies towards Jews, alerted Pope Pius XII in personal reports about the mass murders taking place, and issued the pastoral letter Thou Shalt Not Kill in November 1942, urging his parishioners not to participate in Nazi atrocities. Throughout his life, the Metropolitan was dedicated to preserving Ukraine’s cultural heritage. He collected icons and objects of art, and as a patron of the arts and philanthropist, supported many prominent Ukrainian artists. Today, his collection is the basis of the Andrei Sheptytsky National Museum in Lviv.